These are some of the most compelling names in the auction (for the price). This year’s NamesCon live domain name auction is less than two weeks away. 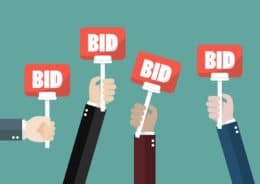 Prebidding is already underway with many domains already at 10+ bids. Most of the names in the auction have a reserve. So far, the most expensive domain to meet its reserve is Multiplexer.com at $2,100. I reviewed the list to find my favorite domains at the reserve range. There are obviously better names in the auction than many of the ones I selected, but given the reserve ranges, these are the ones I find most compelling. Give.com (reserve > $1 million) – This domain sold for $500k in 2015. It reminds me a bit of Great.com and Super.com, which sold last year for about a million dollars each. Depending on how high over a million this domain is, it has good potential. Lucky.com (> $1 million) – Between Lucky.io selling for $67k on park.io a few months ago, online gambling, and brands that use this name, it’s a winner. Piano.com ($400k-$500k) – I’m thinking more as a brand than as an instrument site. Document.com ($300k-$400k) – Files.com just sold for $750k. Document.com has more uses. Athlete.com ($200k-$300k) – I’m including this one because it sold for $122k in the 2008 TRAFFIC auction. I’m curious if it can fetch near that amount ten years later. Leukemia.com ($100k-$200k) – I realize this is difficult to spell but probably not for people who are fighting this horrible cancer. Health Union bought the .net last year for $9k. They build lots of sites on .net, but it might be worth spending a bit more for the .com in this case. Otherwise, perhaps a charity or drug maker can use this domain. Adverbs.com ($5k-$10k) – I like this as a brand, but would prefer the singular version. The domain sold for $1,800 in 2011. Bullied.com ($5k-$10k) – Perfect for a bully prevention organization or help group. This domain sold for $3,400 in 2007. Wipeout.com ($5k-$10k) – I don’t know what you’d use it for…maybe a game? Even though it has a negative connotation, I think it’s a fun name for the right site. The auction takes place January 28, 2019 at the Tropicana Hotel in Las Vegas and online. It is presented by Right of the Dot in conjunction with NameJet.